Viewed from Sheker, hometown to Chingiz Aitmatov, the peak of Manas Ata, right, rises 4,483 meters in the Alatoo range of the Tien Shan Mountains, separating Kyrgyzstan from its neighbor to the north, Kazakhstan. It is named for the Kyrgyz hero Manas, who is said to have united the 40 Kyrgyz tribes a millennium ago. The path to the universe starts from the village. Known among Central Asian Turks as Chingiz ata (respected father), Chingiz Aitmatov was a literary giant who published more than 30 works that have been translated into more than 170 languages. A cultural icon who raised the global profile of his country, he was also a diplomat who helped usher in a new era of independence. From his hometown of Sheker, two mountains tower within view. The taller, sharper one the Kyrgyz honor with the name Manas Ata, after the Kyrgyz hero who lived more than a millennium ago. Locals say Manas used to ride horseback up that mountain and, from its peak, survey the area for approaching enemies. Cascading from the mountain, the Kürküröö River, “a white-foamed pale blue,” surges through fields in the broad, flat valley, feeding life into flora and fauna. “At midnight, I would awaken in the tent from the river’s terrible heaving and see the stars of the blue, calm night peeping,” Aitmatov wrote. Locals say Sheker proclaims itself at the Kürküröö’s headwaters. The river, they say, interweaves the natural world and a thousand years of history that is expressed through oral lore—poetry, songs, speeches, folktales and proverbs—all legacies of nomadic heritage. Törökul, who was born in 1903, grew up schooled in Muslim maktabs and studied Russian. In October 1917, 11 years before Aitmatov was born, the Bolshevik Revolution erupted in Moscow. “The Bolshevik appeal was infectious,” writes Jeff Lilley, author of the recent biography on the late author, Have the Mountains Fallen? Having endured colonialization under Russian tsars, Kyrgyz tribes, like others in the vast region, “believed they had been quite literally saved from extinction,” Lilley continues. Törökul demonstrated energy for the changes the revolution appeared to promise. Moscow relished such young enthusiasts who over the next decade paved the way for newspapers, schools, theaters and clubs of various sorts, all “positive contributions of Soviet communism,” Lilley adds. In 1928 Törökul’s wife, Nagima, bore Chingiz, the first of what would be four children. By that time the land reforms known as collectivization had begun to threaten the very existence of nomadic life, including that of the Kyrgyz, whose history, nature and livelihood depended on their relationship to the land. Törökul, who believed in the egalitarian ideals of the revolution, aided the transition to the new economy. Higher-ups took notice and in 1934 appointed him second secretary of the Kirghiz Committee of the Communist Party of the Soviet Union. 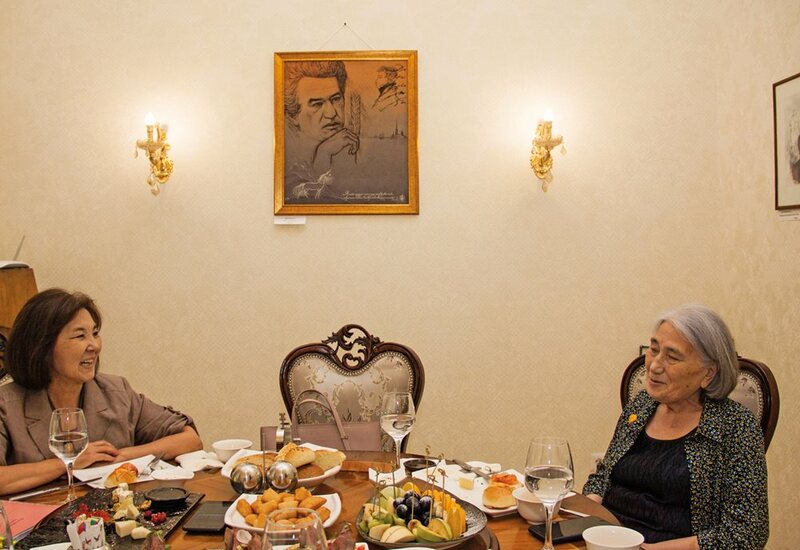 Roza Aitmatova, 81, and youngest sister of Chingiz Aitmatov, discusses family history with Gulnara Jamasheva of the Kyrgyz Academy of Sciences in a room of the Frunze Restaurant in Bishkek recently dedicated to the late author. I dedicate this to you. Not long afterward, in Moscow, Soviet General Secretary Joseph Stalin and the Council of People’s Commissars (the heads of each republic) began attacks on “enemies of the people”—mostly landowners, merchants, nobles, business owners, clergy, monks, members of the political opposition and their kin. Törökul began expressing his doubts, calling people who had been arrested “true patriots of their people.” His record of accomplishment prevented party leaders from doing anything more than removing him from his post and sending him, with his family—by then including Chingiz’s younger siblings Ilgiz and Lyutsia—to Moscow, to pursue higher education, outside of politics. 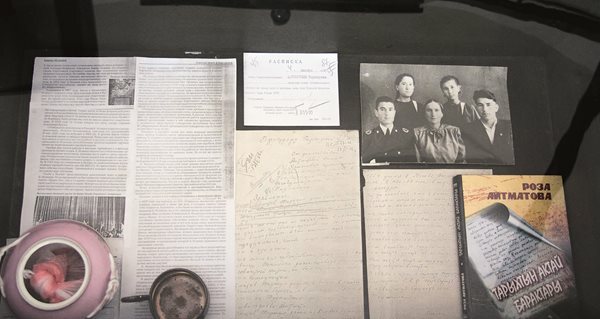 A family history at the museum of Ata Beyit (Graves of Our Fathers) includes photos and letters, and Aitmatova's 2007-published Tarïxïtïn aktay baraktarï (The white pages of history), detailing the tragedy that befell her father, Törökul Aitmatov. Nagima Aitmatova, mother of Chingiz and Roza, who for two decades, "lived ... with transparently deceptive hopes that Törökul would return." Yet politics followed him. Party officials soon labeled Törökul, too, an “enemy of the people.” He implored Nagima to save herself and the children by going back to Sheker, where they could take refuge in the mountains. Nagima was at a loss. According to 81-year-old Roza Aitmatova, Chingiz’s youngest sister, Törökul tried to reassure Nagima. “First, I’m not guilty. Second, I am well-enough known to the Kyrgyz,” he said, and he promised Nagima he would join them as soon as the situation calmed. Törökul was arrested on December 1, 1937. He joined more than 12 million across the Soviet Union—936,750 in Kirghizia alone—who were persecuted that year. It would not be until 20 years later that Nagima would receive an official notice of her husband’s execution on November 5, 1938, and his posthumous rehabilitation. But Nagima had “lived through the course of many long years with transparently deceptive hopes that Törökul would return.… My poor Mama—what did she not go through!” Aitmatov wrote. 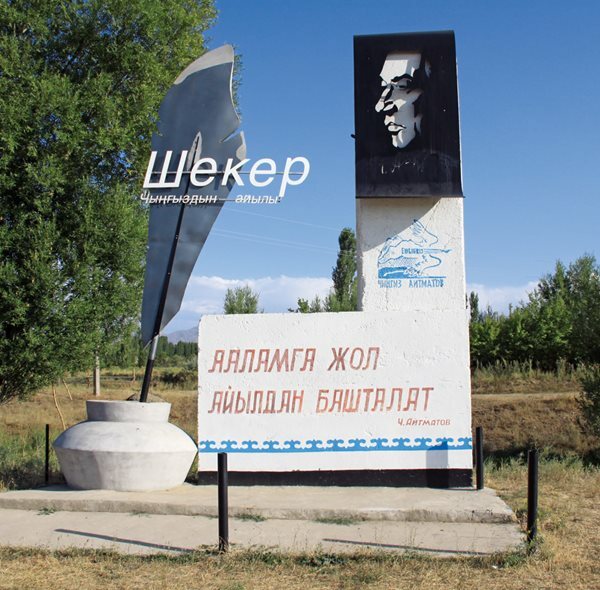 It would be decades until, in 1991, a tip led officials to an undiscovered mass grave on the outskirts of what is now Bishkek, then called Frunze. In it lay 137 victims. Found inside the shirt pocket of one, a letter of condemnation riddled with three bullet holes; on it the name Törökul Aitmatov. east to west, and from west to east. 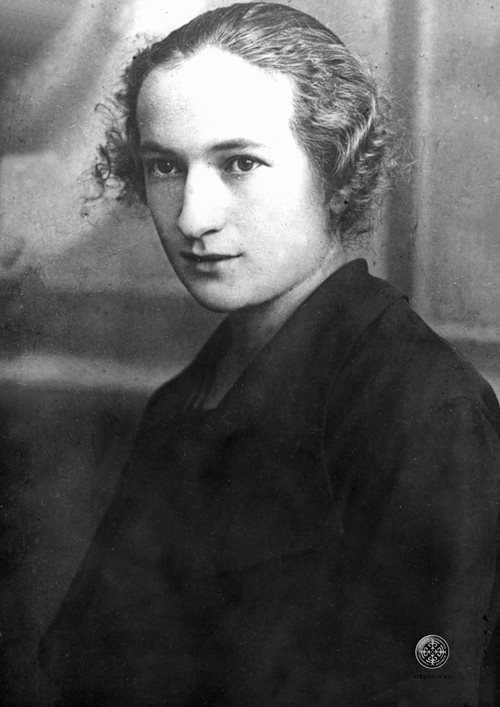 On August 31, 1937, after five days of travel from Moscow, Nagima and the children arrived at Maimak Station in Sheker, the very stretch of railway Nagima’s husband and father-in-law helped construct nearly three decades before. Roza, who was born only months before the family’s departure from Moscow, recalls their story. “Nagima carried one of the girls, leading the second daughter, with her sons barely carrying the luggage,” she says. As kin to an accused “enemy of the state,” the family was a social pariah. In Sheker, Törökul’s mother, Ayïmkan apa (respected mother) and his sister, Aunt Karagïz, became their support. They were “like one and the same grandmother in two persons, the old and the young,” Aitmatov wrote in appreciation. Roza calls Ayïmkan apa the “fountain well of all motivation,” the one who introduced young Chingiz to Kyrgyz nomadic culture. Although it was traditional for the eldest boys to spend their formative years living with their grandparents, Törökul and Nagima had insisted on modern schooling, so in summers Ayïmkan apa took Chingiz to the jailoo (summer pastures). From there, she taught her grandson to dress in chapans (traditional robes), drink kymys (fermented horse milk), ride horses and listen to Manaschis, reciters of the epic Manas. “I saw real nomad camping, which disappeared when life became settled … an exhibition of the best harnesses, finest adornments, best riding horses … performances of improvising women singers,” Aitmatov detailed in a 1972 autobiography. Aitmatov credited Ayïmkan apa for the love he had developed for his first language, Kyrgyz, and the richness of nomadic literary heritage. Among the children in Sheker, she became a “treasure house of fairy tales, old songs and all kinds of true and invented stories,” Aitmatov wrote. Aunt Karagïz, like her mother, was also a storyteller, and even after exhausting all her tales, she turned to dreams to entertain the children. Aitmatov was so fond of her stories that when she napped for even a few minutes, he would wake her and entreat her to describe what she had seen. The war consumed everybody. Those left behind toiled on the land. Mules and oxen were “driven by boys and soldiers’ wives, black with sunburn, wearing faded clothes, their bare feet calloused from the stony roads,” he wrote. Aunt Karagïz openly cursed Stalin for dragging the country to war, and for the first time, Aitmatov saw beyond youthful imagination. “Poverty and hunger in our midst, how all our produce and manpower were being fed into the war,” he wrote. 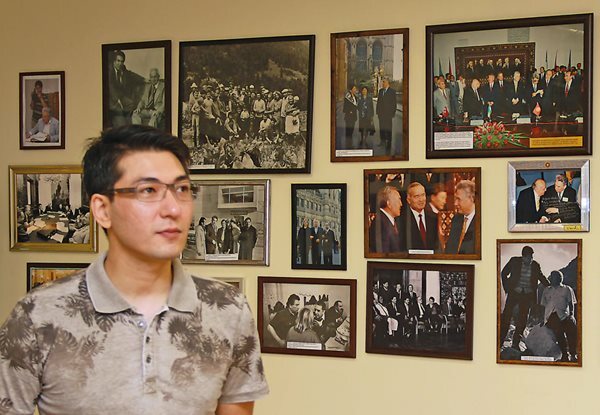 Eldar Aitmatov, 39 and the youngest son of Chingiz Aitmatov, reflects on his father at the Chingiz Aitmatov House Museum in Bishkek, where he serves as director. The museum, which opened in 2014, conserves the late author’s manuscripts, photographs, awards and other personal belongings. Yet writing did not come at once after the war. In 1947 Aitmatov enrolled at the Dzhambul Animal Veterinary Technical School in Kazakhstan. Afterward, he moved to Frunze to work at the Kirghizian Scientific Research Institute of Agriculture, where he wrote two scientific articles. Proximity to the natural world by way of nomadic upbringing and these years studying animal husbandry also influenced his writings, which tended to explore symbiotic relationships between humans and animals. the pen for the sword. That same year, Soviet partisans began a cultural offensive against the Kyrgyz’s central oral epic of Manas, claiming it countered the tenets of socialist realism. It was part of a broad campaign to Sovietize Turkic peoples throughout Central Asia by eliminating national heroic epics. In the Caucasus, Azeris suffered attacks on their hero, Dede Korkut; Kazakhs, Koblandi Batir; the Nogais, Er-Sain; Turkmens, Korkut Ata; Uzbeks, Alpamïsh, and more. Each epic became accused of “religious fanaticism” and “brutal hatred,” writes cultural anthropologist Nienke van der Heide of Leiden University. Supporters across the USSR, however, responded in swift defense of Manas. Party officials forced a conference of some 300 scholars to convene at the Academy of Sciences of Kirghizia, in Frunze. The hall “was packed to the brim,” Aitmatov recalled. “People hung from the door handles, even standing in the street to hear something.” From the doorway, Aitmatov peered in. Sitting at the stage next to the first secretary of the Committee Central was Mukhtar Auezov, a Kazakh historian well regarded for his research on Manas. One by one, speakers assailed the heritage epic. “Privileged” and “pan-Turkism” they charged. “It seemed that at any moment we were going to lose our beloved epic,” Aitmatov lamented. Then Auezov rose from his seat, and he fearlessly defended Manas for nothing less than its intense cultural power. “To take this epic away from the life of its people is like cutting out the tongue of our whole folk,” Auezov said, according to Aitmatov. 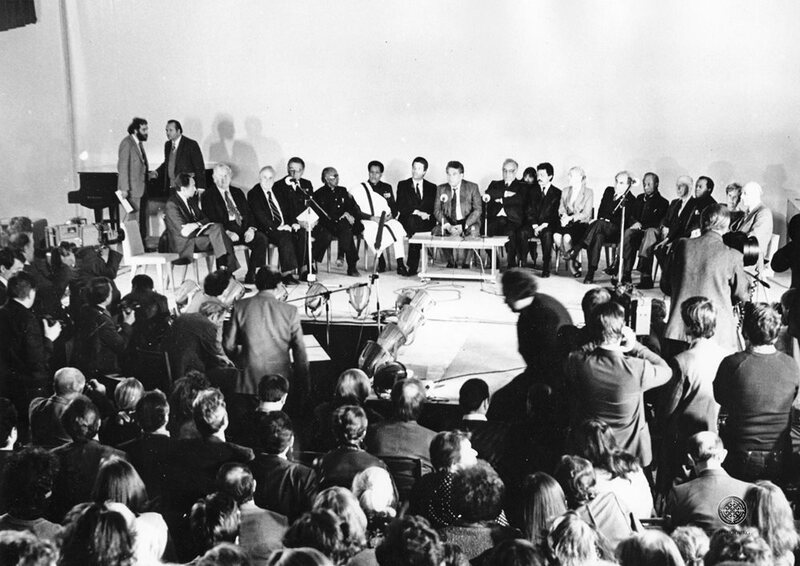 In October 1986 Aitmatov convened 18 influential friends from around the world to meet Soviet Politboro General Secretary Mikhail Gorbachev for what became the Issyk-Kul Forum, during which informal discussions focused on global challenges of ecology, peace and cultural understanding. 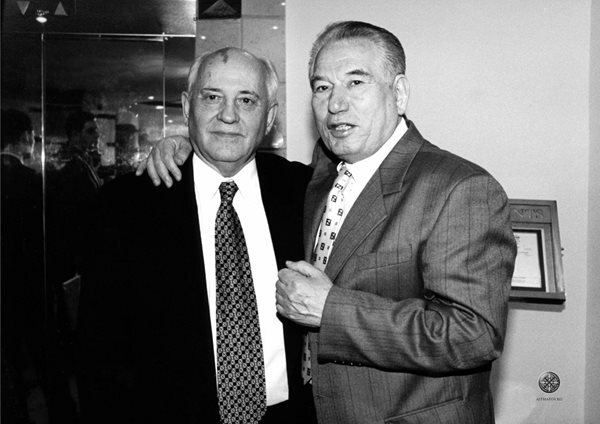 Aitmatov, at right, with Gorbachev, for whom Aitmatov was both a friend and advisor. 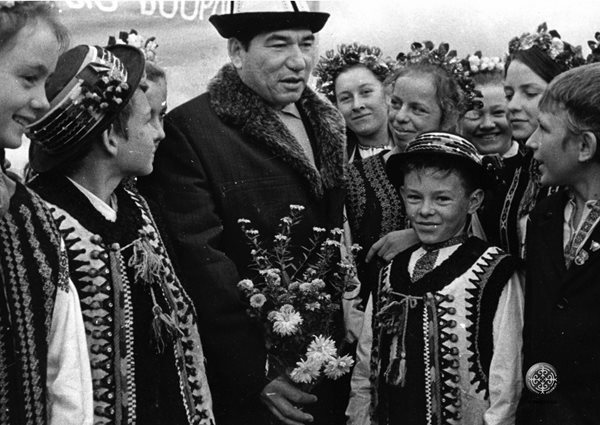 After his 1958 novella Jamila was smuggled out of the Soviet Union and translated into French, Aitmatov became a global figure known for his broad humanitarianism and defense of local cultures. Hundreds of Kyrgyz, overcome by the courage of one man from Kazakhstan speaking out to save their cultural treasure, erupted in applause. The event left a lasting impression on Aitmatov to carry on the same struggle to preserve Manas and, with it, the cultural dignity of his people. Thirty years later he would serve as chief editor of his country’s first printed edition of the Manas recitation, based on recordings made by Auezov. 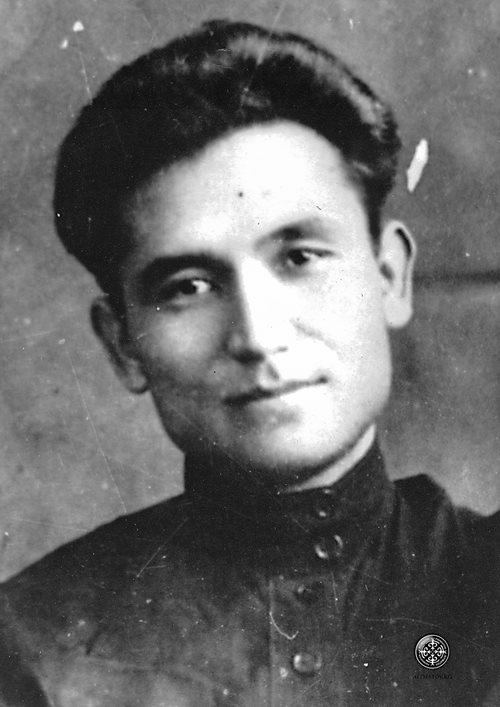 Aitmatov received his greatest acclaim for the compilation when, in 1963, he became only the second recipient from Central Asia to win the Lenin State Prize in Literature, after Auezov. “Dignity was restored to the Aitmatov family,” he recalled. Other Kyrgyz, meanwhile, felt “the Kirghizian folk have once again shown, through Chingiz, that we are a worthy people.” A resulting trip to Europe proved “the author had suddenly become a non-Russian writer of all-union stature,” asserts Mozur. 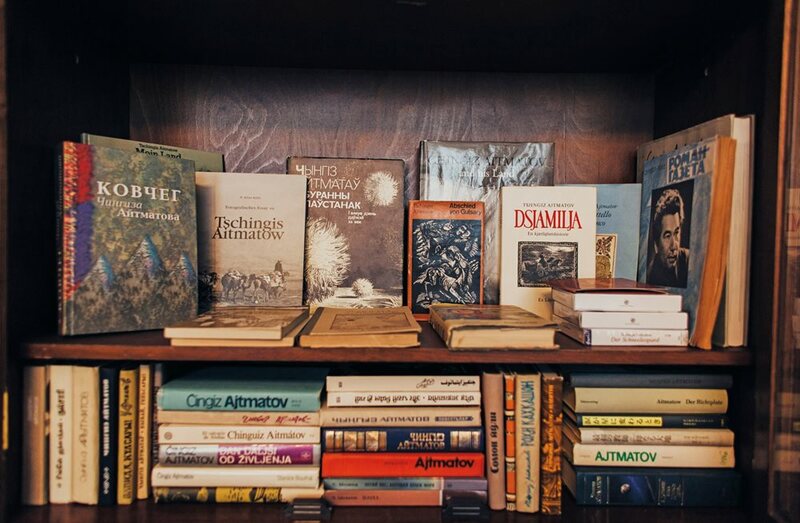 A shelf at the Chingiz Aimatov House Museum holds a collection of the author’s more than 30 works, which have been translated into more than 170 languages. The reproach hardly impeded Aitmatov’s success. Three years later in Moscow, Aitmatov debuted his first play, The Ascent of Mount Fuji, “the most provocative and talked-about drama in Moscow,” The New York Times wrote. Set in 1942, the play revolves around a reunion of four classmates, their wives and a former schoolteacher. One by one, through recollections, they grapple with the shame of having turned their backs against a friend who had attempted to defy Stalin. Two years later, in 1975, through a cultural-exchange program sponsored by the US Department of State, The Ascent of Mount Fuji opened in Washington, D.C. The New York Times lauded Aitmatov as “unquestionably on the side of the angels.” The Washington Post praised the play’s universality as “quite a revelation,” with characters “all too familiar.” The play continued to garner attention in the US, and by 1978, PBS aired a live performance. 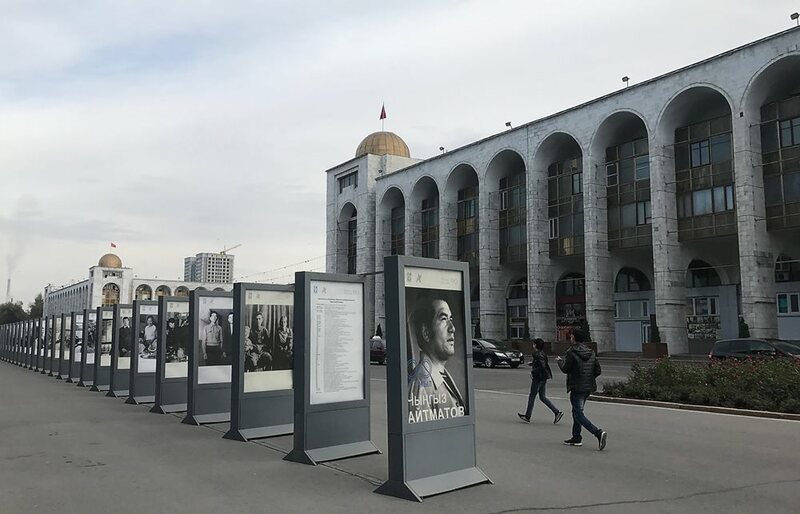 On December 12, 2017, on the 89th anniversary of Aitmatov’s birthday, Kyrgyzstan announced 2018 as “The Year of Chingiz Aitmatov.” Displays like this one, in Bishkek, the capital, decorated streets, halls and other public places to commemorate the 90th anniversary of his birth and to honor his legacy. Aitmatov’s next major work, The Place of the Skull, published in 1986, became a cult sensation across the USSR. The story unfolds in two separate plots, raising concerns about ecological threats on the one hand and campaigns against religion on the other. One of its protagonists, Avdii Kallistratov, is a monk-turned-journalist, and through him, Aitmatov demonstrates the fortitude of belief and the spirit of good over evil. The work was a first on many levels: For starters, Kallistratov is unlike any of Aitmatov’s other heroes. He is both Russian and Christian, neither Kyrgyz nor Kazakh; yet the story manages to incorporate both Central Asian and Islamic allegories. It is also notable for being the book that capitalized—for the first time in Soviet history—the word God. Finally, the story brought to the forefront the issue of drug abuse—heretofore an unspoken problem in the Soviet Union. Four months after the book’s publication, in October 1986, Aitmatov initiated a meeting in Kirghizia’s northeastern province of Issyk-Kul among 18 creative figures including American playwright Arthur Miller, French Nobel Laureate Claude Simon, English actor and writer Peter Ustinov, and Soviet Politburo General Secretary Mikhail Gorbachev. The Issyk-Kul Forum, as they called it, was a discussion of ways to prevent a nuclear war, spearhead an ecological campaign and present “national and global aspects of cultures in present-day conflicts,” Aitmatov wrote. Gorbachev, who viewed Aitmatov as both a friend and advisor, addressed the participants and called its declaration “a tremendous document confirming the results of the new way of thinking.” He further praised its significance and vowed to pursue a system “using openness and democracy”—one of his first articulations of what became his signature policies of glasnost and perestroika, or openness and reconstruction. After independence in 1991, Aitmatov declined suggestions he should serve as president. With this, Aitmatov used his platform on behalf of other fellow Central Asians. In one notable instance in 1989, certain elites from Uzbekistan ignited national outrage after falsifying cotton production numbers, with the result that Russians turned on both Uzbeks and other Central Asians. Aitmatov responded by criticizing the condemnation of Uzbeks, as they were the ones “most adversely affected by corruption.” So thankful were the Uzbeks for his loyalty that Islom Karimov, the late president of Uzbekistan, appointed him as the first president of a Central Asian Turkic union. During the same period in 1989, the Congress of People’s Deputies singled out Aitmatov from as many as 2,500 members to “place the Soviet leader’s name in nomination of Chairman of the USSR Supreme Soviet,” says political scientist Eugene Huskey of Stetson University in Florida. Then, upon the establishment of the Congress, in front of millions of television viewers, Aitmatov declared the societies of Sweden, Norway, Finland, Spain and the Netherlands “something we [Soviets] can only dream about.” Despite such statements—or perhaps because of them—in February 1990 Gorbachev appointed Aitmatov as a part of a 10-member Presidential Council. Glasnost and perestroika, however, had unintended ramifications. Nationalistic sentiment flared into rage, which grew into interethnic conflict. 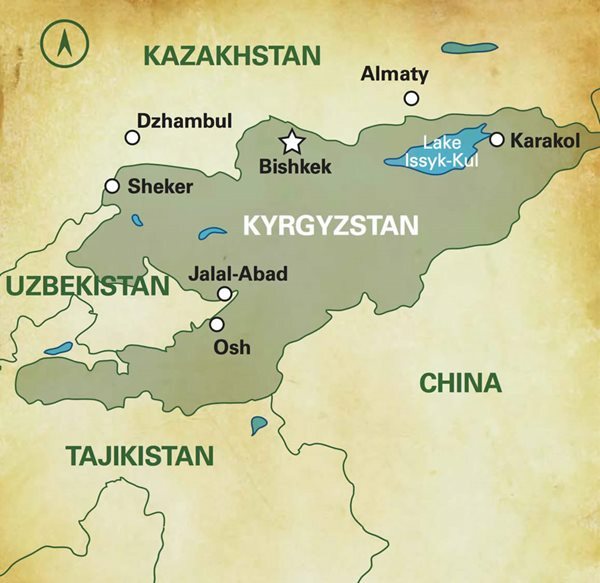 One of the most violent episodes occurred between Uzbeks and Kyrgyz in June 1990 in Kyrgystan’s southern city of Osh. Aitmatov immediately flew from Moscow to calm both sides and remind them of their common heritage. “We are fraternal nations. Our roots are the same, they are joined in our Turkic family,” he said. For this, many Uzbeks still credit Aitmatov for having helped to stop the conflict, says his son, Eldar. Glasnost and perestroika also took much of the blame for the eventual downfall of the Soviet Union, but Aitmatov praised its outcome. “For the West this period signified the end of the Cold War and the reunification of Germany; for the USSR it meant the division without bloodshed of the Soviet imperium into independence,” Aitmatov said. Even before the Soviet breakup, however, Aitmatov had tired of political life. He yearned for the time to write again, and Gorbachev appointed him ambassador to Luxembourg. This marked the beginning of his official diplomatic career for the Soviet Union, then for Russia and, finally, for Kyrgyzstan, which became independent in 1991. Although many Kyrgyz encouraged him to become president, he declined. 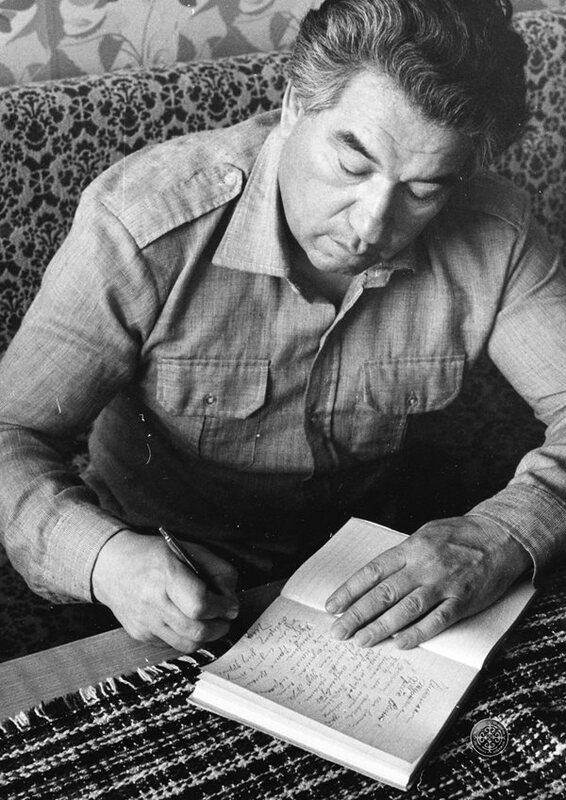 Many, Eldar says, felt that with his time away in Europe, “he left them.” Aitmatov, however, understood that his role for his people was to continue telling his truth through his writing. His next book, The Mark of Cassandra, focuses on space travel and cloning. It was published in 1995, the same year he began serving as an in-absentia member of Kyrgyzstan’s parliament. In 2008 Aitmatov published his last work, Toolor Kulaganda (When the mountains collapse). At the same time, other Turkic nations nominated him for the Nobel Peace Prize. In May of that year, while in Tataristan, Russia, he suddenly fell critically ill. Gorbachev arranged for Eldar to accompany his father to Germany for treatment. Eldar recalls that from the airport en route to the hospital, the paramedics recognized Aitmatov. “They knew him. They knew exactly his works,” Eldar says. Aitmatov passed away nearly a month later, on June 10, 2018, at age 79. 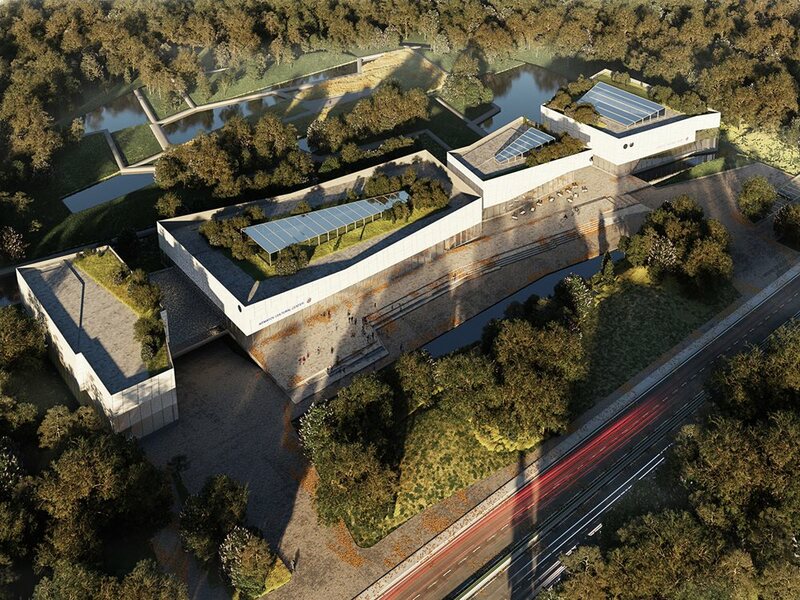 An architectural rendering shows the future home of the Chingiz Aitmatov International Foundation, for which his son, Eldar, serves as president. An internationally supported project, the center will include a school, a museum, and most importantly, it will also “keep alive Aitmatov’s philosophy,” Eldar says. A person does not die while he is remembered. On December 12, 2017, on the 89th anniversary of Aitmatov’s birth, Kyrgyzstan announced 2018 “The Year of Chingiz Aitmatov.” This, Eldar maintains, represented a national opportunity after a decade of political and economic instability. “Time has passed, [and] people look at it differently now—from a different perspective, and now they really understand whom they lost.” The celebrations involved every region of the country. “Even the medical college is doing some events—people not even linked to literature or culture,” says Eldar. Aitmatov was a cultural bridge to unity for all of Central Asia—and for everyone beyond affected by the hardships of the 20th century. “They all considered him their own, a part of their culture,” Eldar says. “It was the Russians who organized his 75th-birthday celebration, and when he was leaving his post in Belgium, it was the Kazakh Embassy who made the main event.” Now seven nations, including Luxembourg, have commemorated him by naming major thoroughfares in his honor. Eldar, too, has taken it upon himself to carry the mantle of his father’s message. With plans for the Chingiz Aitmatov International Foundation to open an internationally funded state-of-the-art cultural center in Bishkek that will include a school and museum, Eldar’s goal is to connect the next generation with his father. “He belongs to every Kyrgyz, and every Kyrgyz should know him,” says Eldar. The author is grateful to Azamat Sadykov, translator and degree candidate in marketing and communications, for his professional contributions in planning, interpretation and transcription. Seitek Moldokasymov is a freelance photographer based in Kyrgyzstan who specializes in nature and landscape. His work has been published in tourism-related websites, calendars and periodicals. This is his second contribution to AramcoWorld. Alva Robinson is an assistant editor at AramcoWorld. He holds a master’s degree in Turkic Literary Studies from the University of Washington, and he taught English for four years at International Alatoo University in Bishkek, Kyrgystan. He is also the founding editor of the Journal of Central and Inner Asian Dialogue.